How to get kids appetite back especially when they are recovering from a viral infection ? 'A' was knocked out by tummy bug unable to keep even a glass of water down. Now he is doing better, but still not back to his normal appetite. He shows extreme disinterest to eat from his plate at first sight. You must have heard or read that "People eat with their eyes first" and the first rule to fulfill above saying would be to get balanced contrasting colors on the plate. Kids feel nice to see something bright and colourful on their plate especially when their appetite has gone down. I browsed through the fridge to check my veggies stock and came across beetroot, a nutritious root vegetable that has a catchy pink color and is known to boost the energy levels too. This root vegetable has many health benefits which you can read here. 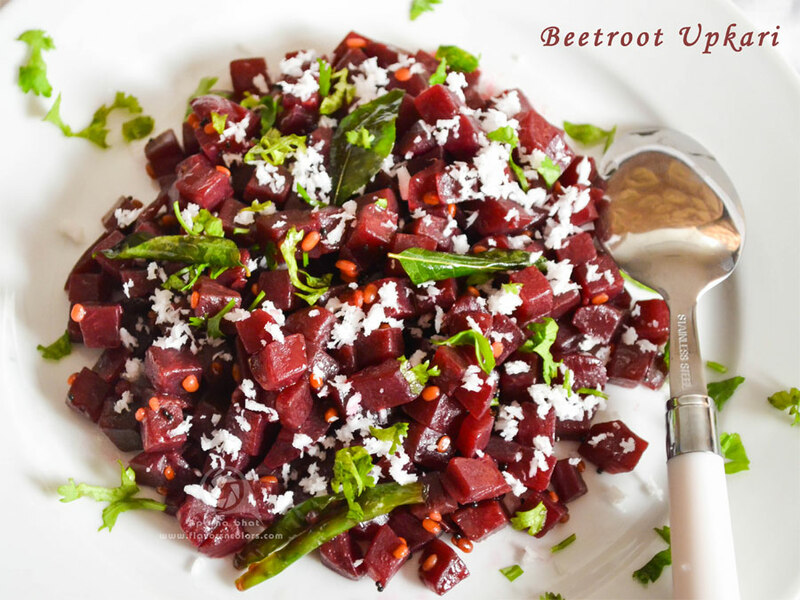 'A' too love this veggie and hence decided to prepare a simple beetroot upkari/stirfry [prepared in most of the konkani household]. Hope this pink color brightens up his plate, whet his appetite and boosts his energy. Wash, peel and chop beetroot into small cubes. In a pan, heat coconut oil. Add mustard seeds and once they splutter add urad dal. Fry it for a min or till dal becomes golden brown in color. Next add green chili, curry leaves, chopped beetroot. Mix well, cover the pan with a lid and cook it on medium flame till the beetroot is cooked. Stir at regular intervals, sprinkle some water [if needed] to prevent the base of pan and veggies from getting burnt. Add salt. [I add sugar at times when the beet that I get from market are not sweet]. Once it is cooked add grated coconut and mix it well. Garnish it with grated coconut and finely chopped coriander leaves [optional step]. Healthy beetroot upkari/stirfry is ready. Serve it as a side dish with rotis or rice and dal/curry. 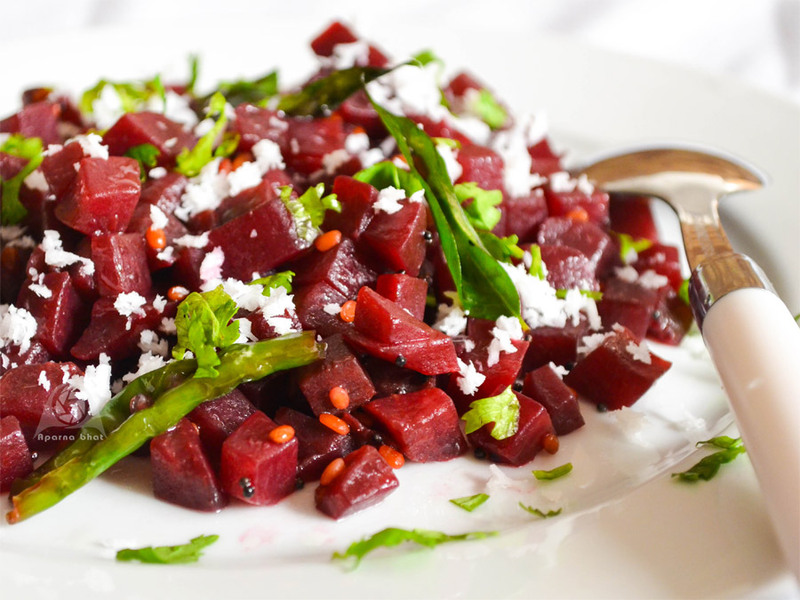 Note: You can add precooked beetroot cubes to reduce the cooking time.